At Cedar Crest Farm we have a passion for Irish horses, a passion that we share with our clients by letting them ride classic examples of the breed that we have personally selected and imported. Why did we choose Irish horses to fulfill the role of our equine teachers? Because they are sound and sane, tough yet biddable. They have been bred for centuries to perform innumerable tasks and continue to do so today with remarkable success. In fact, for several years now, Irish Sport Horses have lead the way as the winning-most event horses in the F.E.I. world rankings and their enduring fame and success as show-jumpers is recognized from Japan to Brazil and all countries in between. What is an Irish Sport Horse? Irish Sport Horses are normally a cross between the Irish Draught Horse and the Thoroughbred, in any proportion, although increasingly nowadays some other Continental blood may also be introduced into the mix. Ireland’s soil, climate and culture makes it the most horse friendly place on earth. The Irish Draught has benefited from this environment for centuries and has evolved into Ireland’s unique contribution to the equine world. Tracing its roots back to Celtic times on its island home it has gradually evolved, due in no small part to Ireland’s geo-political history, into an animal with versatility far beyond that which its name implies. While having the strength and placid temperament of the working horse, the Irish Draught is not simply a draught animal in the usual application of that word to the equine. Instead, as it evolved on farms in the Irish countryside it became imbued with the qualities of a riding and sporting horse as well. Typically, the Irish Draught horse of old would have been expected to pull the plough during the week, take the farmer hunting on Saturday and then transport the family to mass on Sunday morning in the gig. The crossing of this ancient, people-friendly breed with the Thoroughbred which also thrives so well on Irish pastures, has resulted in the modern Irish Sport Horse. These hybrids combine the strength, stamina and sensible nature of their Draught Horse ancestors with the speed, endurance and intelligence of the Thoroughbred to provide the ideal participants for our modern equine sports. Using our trusted friends and contacts in Ireland and the U.K. our policy has always been to select well-conformed, sound horses to use in our lesson program at Cedar Crest. As the cost of importation is substantial, however, we do not buy typical lesson horses, but instead purchase quality horses of competition standard who will one day find homes as eventers, show-jumpers or foxhunters in the U.S.A. Most of our imports will already have experience in the show-ring or the hunt field and past imports include the winner of the middleweight hunter championship at the Royal Dublin Horse Show. Once our selections arrive in the U.S. we ensure that they have plenty of time to settle down. We have found that it can take up to a year for horses to relax completely, not surprising when all their senses are assailed by new stimuli. America tastes different, looks different and sounds different to the way things were back home and, depending on the time of year they arrive, it can be much hotter or much colder than they have previously experienced. Patient schooling and accepting that you cannot inflict deadlines on horses is key in allowing them to recover from the shock of their unexpected journey. The consistent routines and the quiet efficiency of our staff which prevail at Cedar Crest ensure that horses immediately feel relaxed when they enter the barn. Whilst most of the horses used in our lesson program hail from overseas we also make use of suitable locally-produced horses if they meet our standards in terms of conformation, soundness and temperament. Canadian Sport Horses in particular, with their mix of Shire or Clydesdale and Thoroughbred, can be useful assets in any teaching program. Wherever the horse hails from originally, it is our mission that he should only spend a year or two working in our lesson program before he is sold to a private owner. 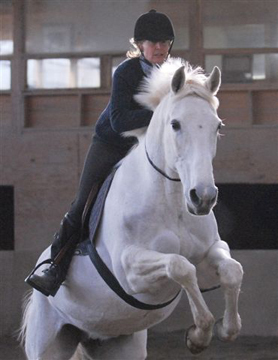 As a result, no horse has to endure the rigors of meeting the needs of different riders over a prolonged period of time and no rider at Cedar Crest is faced with riding a horse who is no longer a willing participant in the learning process. In this way, the horses always have a sparkle in their eyes and our lesson clients quickly learn to become riders and not just passengers on horses who have long-since lost their enthusiasm for work. Most of our school horses are in their prime but there is one older horse that everyone loves to ride if given the chance – the great Penny Sparkle. Purchased as a 6-year-old through Irish show-jumping legend Paul Darragh in 1994, Penny won many classes in the U.K. before she and Gerry emigrated (on the same plane!) 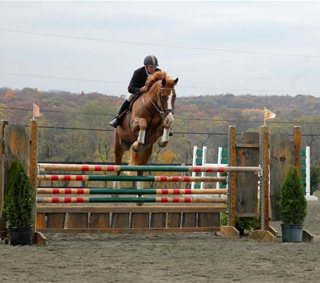 in December of that year to take up residence at Millbrook Equestrian Center. Once in the U.S.A., Penny continued her winning ways in the show-jumping arena and became renowned locally for her gorgeous looks and sparkling personality. Whether it was clearing the 5’ paddock rails to take herself hunting with the Millbrook hounds; jumping advanced cross-country fences on a clinic with Capt. Mark Phillips or showing off her trademark skill of jumping a course without benefit of a bridle, Penny has been the epitome of the sound, talented Irish Sport Horse. Now in her 20s she is still a force to be reckoned with and has introduced many clients to the fun of competing. She also has a legacy in the form of her daughter, Ruby Sparkle, who now also forms part of our talented school horse team.